This is the next chapter in The Beauty Brains‘ Cosmetic Diseases and Disorder Series, which is intended to help our community understand conditions that can make it impossible for some people to enjoy the same beauty experiences that most of us take for granted. This chapter covers Hirsutism, which is what happens when hair starts growing in places it’s not supposed to. 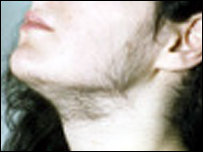 Hirsutism is the medical term for excess body or facial hair in women. If you`ve ever seen pictures of the legendary Bearded Ladies from the turn of the century circuses, then you have a good idea of what Hirsutism looks like. This condition occurs when hormones run amok, causing women to experience male hair growth patterns and it`s estimated that Hirsutism affects between 5% to 10% of all women. FYI, be careful not to confuse Hirsutism with Hypertrichosis. Hypertrichosis is a condition that causes excessive hair growth on normal parts of your body. For example, it`s normal for a man to have chest hair. But if a man`s chest looks like a bear skin rug, then he might be producing TOO much hair “ this is hypertrichosis. On the other hand, if a woman has hair in places she`s not supposed to, like on her chest (or in the case of the bearded lady mentioned above, on her face) then she has Hirsutism. It`s all about the balance of Androgens, a type of male hormone, in the female body. Specifically, Hirsutism can be caused by either an increase in production of testosterone and androstenedione, or an increased sensitivity of the skin to these hormones. In some cases, it may be a symptom of a more serious condition such as adrenal hyperplasia or ovarian tumors, particularly. If your hair growth patterns have changed dramatically, it couldn’t hurt to consult with your physician. Luckily, the symptoms are limited to the hair growth examples describe above. By itself, hirsutism is embarrassing but harmless. Click the links below for examples of Hairs Gone Wild. There are several effective ways to treat this condition. If hair growth is light, you may be able to just bleach the hair to make it less noticeable. (Hydrogen peroxide is commonly used for bleaching.) For more serious growth you can get rid of it by mechanical and chemical hair removal. (Depilatories and shaving are the most common methods.) You can also use temporary epilation which involves removing the hair at the root level. (Plucking, tweezing, and waxing are popular methods.) Finally, you can use permanent epilicaton method like electrolysis, thermolysis, or laser removal. Next post: Do I really need to put protein on my hair?